The two telephones depicted on the panel represent the way in which Stephen kept in touch with all his friends around the world throughout his life. He made friends easily and kept in touch with all of them, as well as family, by telephone, a pastime which consumed many hours every week. The NZ – UK – USA – UK – NZ links show where Stephen chose to live throughout his adult life. The old style telephone at the top is similar to one his mother had at the time and the push-button one at the bottom represents the type of phone he used. Stephen was an Old Boy of Nelson College, consequently, the College colours form the background for the Quilt. The fantails, along with white herons, were his favourite birds. While living in London, Stephen owned/managed various nightclubs etc. in the West End, with many of Britain’s top entertainers being regular patrons. Stephen got to know them all on a personal level. After he died, there was a memorial service for him in St. Stephen’s Chapel, in London’s West End, the church is packed to overflowing, and among those attending, was literally a Who’s Who of the British entertainment industry at the time. This time in London is remembered on the Quilt by the multi-coloured links between the telephones, from the disco lights in the night-clubs. Stephen spent the last few months of his life in Nelson Hospital before being flown to his mother’s home where he died. This was covered extensively in the local newspapers at the time. 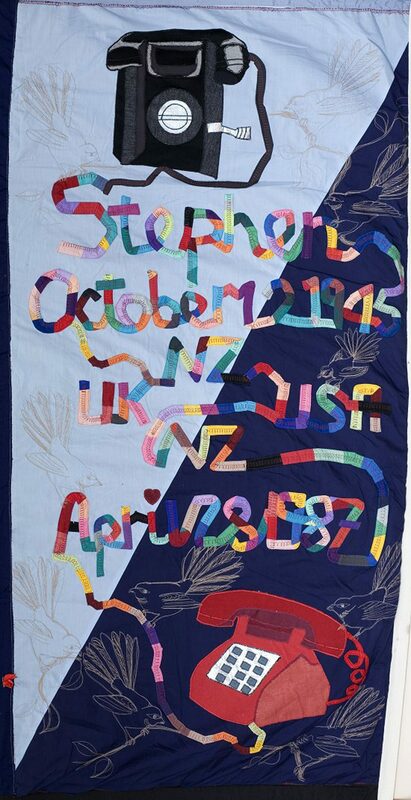 Stephen was one of the first people to die as a result of AIDS in New Zealand and the first one in the South Island.